Bookbinders are curious folk. They are generous with their knowledge, and they are usually quick to share and exchange experiences, successes, and ravenous mishaps. The best illustration of this being the Book Arts List Serv (found at www.philobiblon.com). This online forum of bookbinders, book artists, book lurkers, conservationists and regular humans has been a world wide meeting point for over 20 years. I can't imagine where bookbinding would be (or wouldn't be) today without this resource. It's no surprise, then, that a lot of bookbinders write books on how to make books. And even less surprisingly, the books bookbinders write about how to make books tend to be really good. There are many out there. Today I pay homage to the mainstays in our studio. The books that have made us the binders we are today. 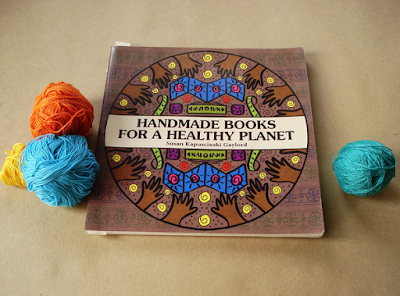 I am honored that Handmade Books For A Healthy Planet is included in the list. I so appreciate Alex's kind words and that fact that she is sharing the book on another continent. You can read the post here. When I get overwhelmed by the connectivity of the world we live in, I think of sharing like this and I am glad to be a part of it.